Thunderful Publishing ha recentemente rivelato la data di uscita ufficiale di SteamWorld Quest, titolo disponibile prossimamente su Nintendo Switch. La new entry del franchise di Image & Form sembrerebbe proiettarsi verso un fantasy RPG a turni, ed è in arrivo il prossimo 25 aprile 2019 sull’eShop di Nintendo Switch, al prezzo di $24.99 / €24.99 / £22.49. Potete trovare il video in questione in calce all’articolo. SteamWorld Quest Hits Nintendo Switch on April 25th! Image & Form’s RPG Draws Near! Gothenburg, Sweden. 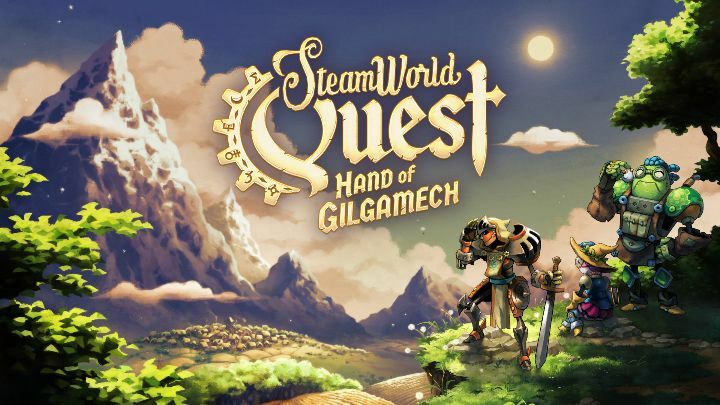 March 26 – Thunderful Publishing is proud to announce that the latest game from Image & Form, SteamWorld Quest: Hand of Gilgamech, comes first to Nintendo Switch on April 25th. The game is available exclusively on Nintendo eShop for the foreseeable future and goes for $24.99 / €24.99 / £22.49. Once again the Gothenburg-based studio take the SteamWorld franchise in a bold new direction; SteamWorld Quest is their first RPG and Image & Form is switching things up with card-based battles where you build, craft and upgrade your heroes’ decks. “The SteamWorld community has asked us to make an RPG for a long time, so I’m really happy and satisfied that we’re delivering such a polished title way sooner than anyone expected. Since we announced in January we’ve watched the growing excitement among gamers, press and content creators. I’m confident that fans of RPGs and previous SteamWorld games will adore SteamWorld Quest because it’s an absolute gem. We will keep the momentum going via our website and social media channels until the release and beyond,” says Brjánn Sigurgeirsson, CEO at Image & Form. In SteamWorld Quest, you lead a party of aspiring heroes who take on whatever threat comes their way by crafting your own deck of cards – choosing from over 100 unique punch-cards! What awaits you is a luscious treasure chest filled with gold, dragons, vivid worlds, magic, knights in shining armor as well as XP, turn-based combat and all the usuals that RPG fans love! The mix of traditional fantasy and bantering steam-driven robots makes for an unforgettable experience with lots of laughs. In one sentence: SteamWorld Quest hits Nintendo Switch digitally on April 25th for $24.99 or your region’s equivalent. Please follow Image & Form on social media for future updates. Image & Form is a video game development studio made up of more than a dozen childishly creative people in Gothenburg, Sweden. They’ve been at it since 1997, and are more productive than ever. Their biggest achievement to date is the best-selling, award-winning SteamWorld franchise. Thunderful AB was founded in December 2017 as a parent company to Gothenburg, Sweden-based game development studios Image & Form International AB and Zoink AB, two of the most successful studios in the Swedish gaming industry. Together with the newly founded Thunderful Publishing, the companies can now act more forcefully and bring something very attractive to the market.